Unfortunately, what is known of China and thought of as Chinese history and civilization by many in the non Asian world today is tainted by inaccurate information. Much of this misinformation dates back to the period of my father’s birth. In 1433 CE the Ming Emperor of China declared China the center of all civilization and began the isolation of China. This led to China’s 500 year decline culminating in a dark period of Chinese history called by some the Time of China’s Sorrows.My father was born in China during that period. Unfortunately it’s that China that many Westerner’s think of as the totality of Chinese history. They think of rickshaws, Chinese “coolies” like those who helped build our western railroads, Chinese laundry workers and 3rd world basic human survival as the typical Chinese historic way of life. 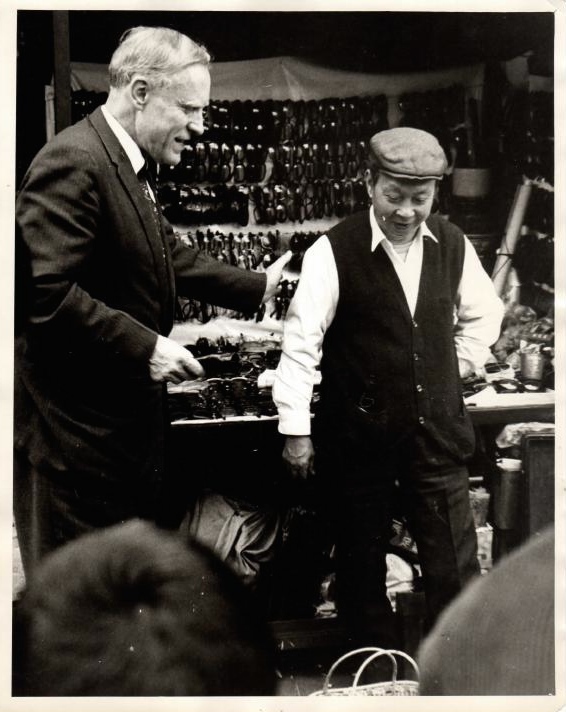 These stereotypes of 19th and early 20th century Chinese civilization obscure and diminish the fact that China throughout much of human history has been a leading civilization when not the world leader itself. During these ancient and premodern times of greatness China has been an innovator in the development of science, technology and civilization. The Great Wall of China started in the 7th century BCE. The actual wall is 3,889 miles long. (The distance from the west coast of N. America to the east coast is approximately 3,300 miles.) It is reported that the Great Wall with all of its branches is 13,171 miles long. The Chinese Grand Canal (1100 miles long) Constructed: 5th century BCE to 7th century CE Substantial sections are still in use today. The longest canal ever built. There have been debates as to whether the largest Ming Dynasty ships were actually as long as 400 feet long. However, there is no disputing the fact that these largest Chinese ships and fleets were far larger than any Western equivalents at that time and until several centuries later. 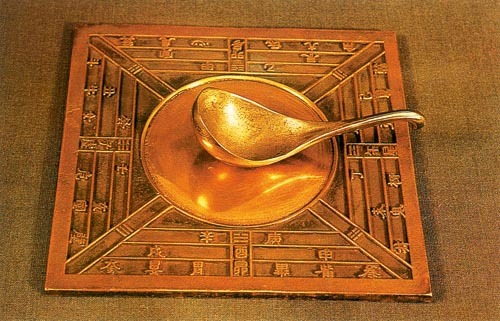 If people are unaware of China’s numerous ancient and pre modern contributions to science, technology and world civilization it is easy to dismiss claims as well as evidence of Asian Pre Columbian contact and influences in North America. However, those that are aware of the advanced level of pre modern Chinese shipbuilding, navigational equipment and navigational skills have no difficulty believing that Chinese (Asian) sailors and explorers would have had no difficulty traveling to and from North America. This is made even easier knowing that ancient Chinese seafarers were aware of what we know today as the North Pacific Gyne. The Chinese knew of it as the Wei Lu current. The North Pacific Gyre consists of four interconnecting ocean currents flowing clockwise around the North Pacific Rim connecting Asia and North America. We know the Wei Lu (North Pacific Gyre) was the easiest route to sail from Asia to North America and then back to Asia. We know this by reading four separate reports by four completely independent sources spread over a thousand years. Hwui Shan’s 502 CE report to Emperor Wu Ti recorded in the Liang Shu. This account gives details of the countries and cultures that this Buddhist monk and his fellow clerics encountered on their way to a place across the Eastern Sea the ancient Chinese knew as Fu Sang. He also measured and recorded the distance between the major points he encountered using the Chinese li as the measurement. The known route of the Spanish Galleons from the Philippines to Seville, Spain via Acapulco, Mexico from 1565 to 1815. Spanish sea captains had numerous disastrous voyages before they also discovered the way to sail safely east and west across the North Pacific Ocean. In the western world these Spanish sea captains are now given credit for discovering this oceanic pathway. That is in spite of the fact that Hwui Shan & Marco Polo also described using this same well-known Asian route 1100 & then 300 years earlier. In 1871 Colonel Barclay Kennon wrote a report of this same route across the Pacific Ocean taken previously by Hwui Shan, Marco Polo and the spanish sea captains traveling back and forth between the Philippines and Mexico. In 1853 to 1856 Lt. Kennon was the navigator of the United States North Pacific Surveying Expedition tasked with surveying the route of the oceanic currents of the North Pacific connecting Asia and North America. 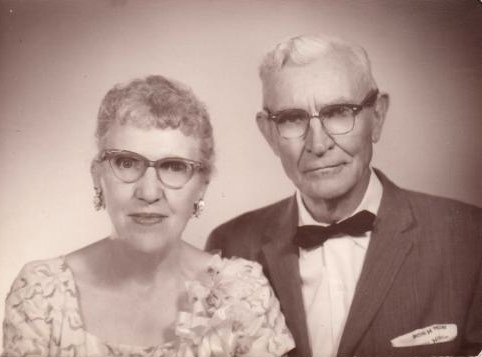 Google: “Navigating the North Pacific – Barclay Kennon”. His report not only details the ease of traveling the northern section of the currents connecting Asia to North America it also shares his thoughts on his studies in 1854 of Asian latitude and longitude that he came across while in Japan. "The first Bible Training Conference for mountaineer Christian leaders Approx. 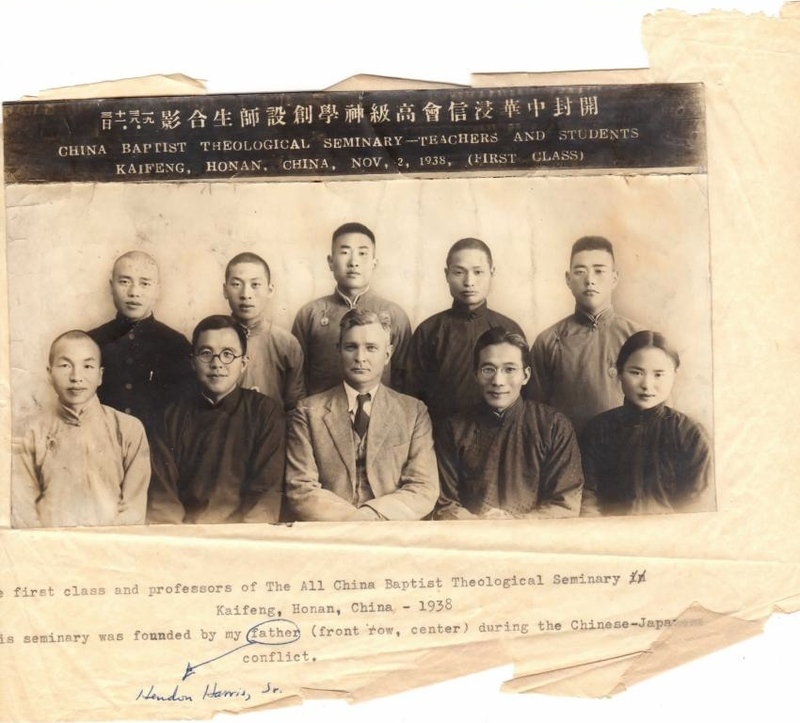 1953 My father, Dr. Hendon M. Harris, Jr. is in the center of the bottom row"
"The first class and professors of The All China Baptist Theological Seminary Kaifeng, Honan China--1938". 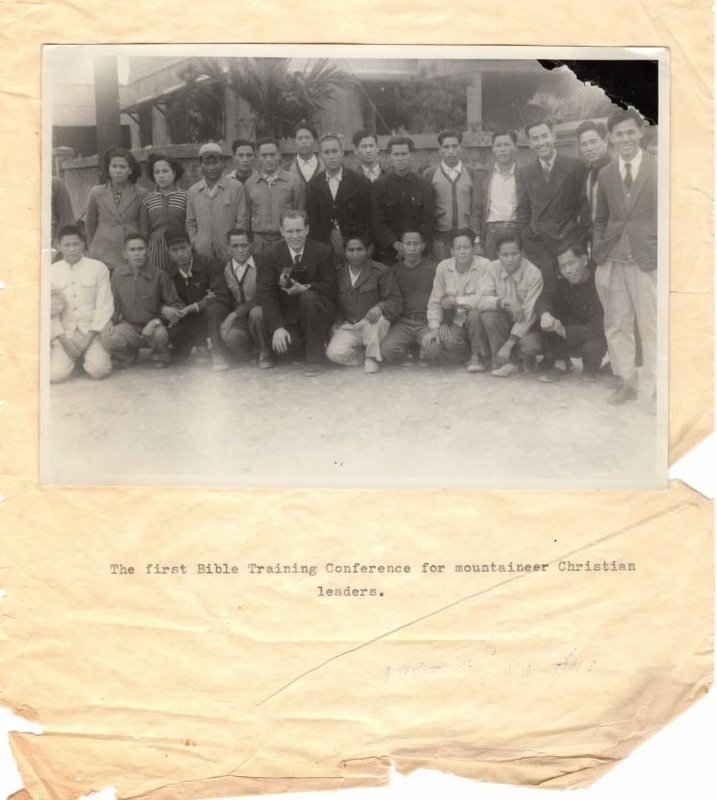 This seminary was founded by my grandfather, Dr. Hendon M. Harris, Sr., (front row center) during the Chinese Japanese conflict.